History’s Corner – JAN 2019 | F.F.A.M. Most readers of the “History’s Corner” section of the newsletter know from previous articles over the years that I am a huge fan of “vintage” fire apparatus. From the inception of motor fire apparatus in our country in the early 1900’s, literally hundreds of fire truck manufacturers have come and gone. Thousands of fire trucks have also come and gone in that period of time but lots of them have also survived to live on to support our fire service heritage. At one time in my life, our family actually owned as many as four “antique” fire apparatus. Fortunately for my continued effort to stay married for over thirty year’s we are down to one – the most important one – a 1939 Chevrolet/Central pumper built by Central Fire Truck Corporation of St. Louis. 1939 Chevy/Central became part of our family in 1978 and has been featured in daughter’s and granddaughter’s weddings and tons of parades. 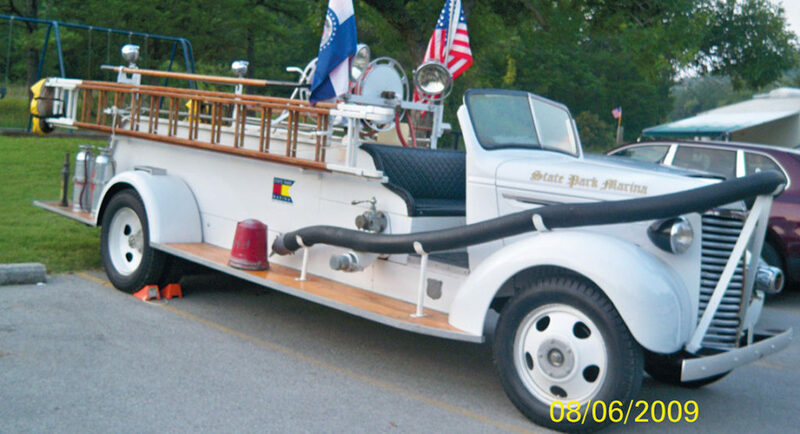 It is all original with a 216 straight six engine, four speed manual transmission and has a Waterous 400 gallon per minute rotary gear mid-ship mounted fire pump. This is the first 1939 rig featured in this article. 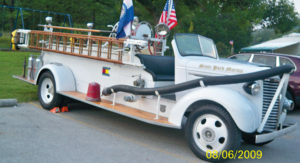 It was delivered to the Montgomery City, Missouri Fire Department sometime in late fall 1939 by Jack Manning, a partner in Lang and Manning Company, a dealer for Central. According to Jack, they “shot water over the Court House,” and it was one of the first apparatus built by Central that was painted white. 1939 was also a banner year for Bill and Kathryn Westhoff who lived in O’Fallon, Missouri. They also took delivery of a smaller package in a little white frame house on Elm Street about a block off Main Street. That delivery was ME! I was born on November 18th, 1939, which was around the same time that Jack Manning was delivering the 1939 open cab Chevy to Montgomery City. Delivery photo of the Joplin Fire Deptartment new ladder truck in 1939. 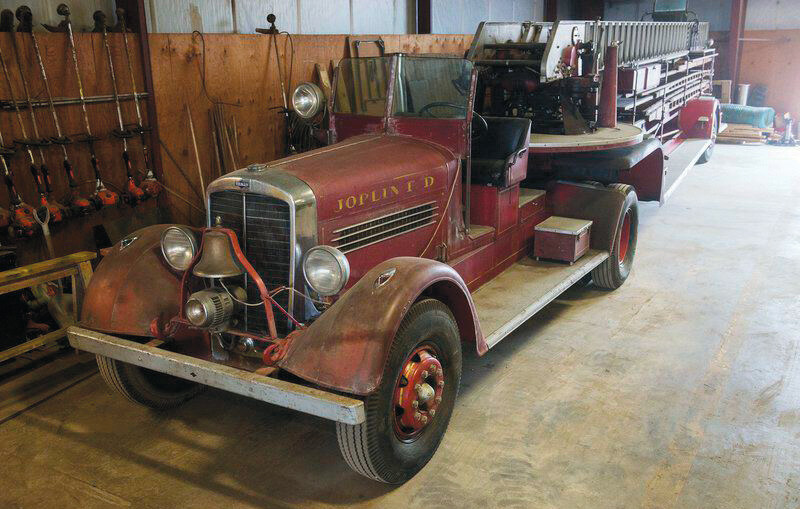 The year of 1939 was one of great progress for the City of Joplin and its Fire Department. 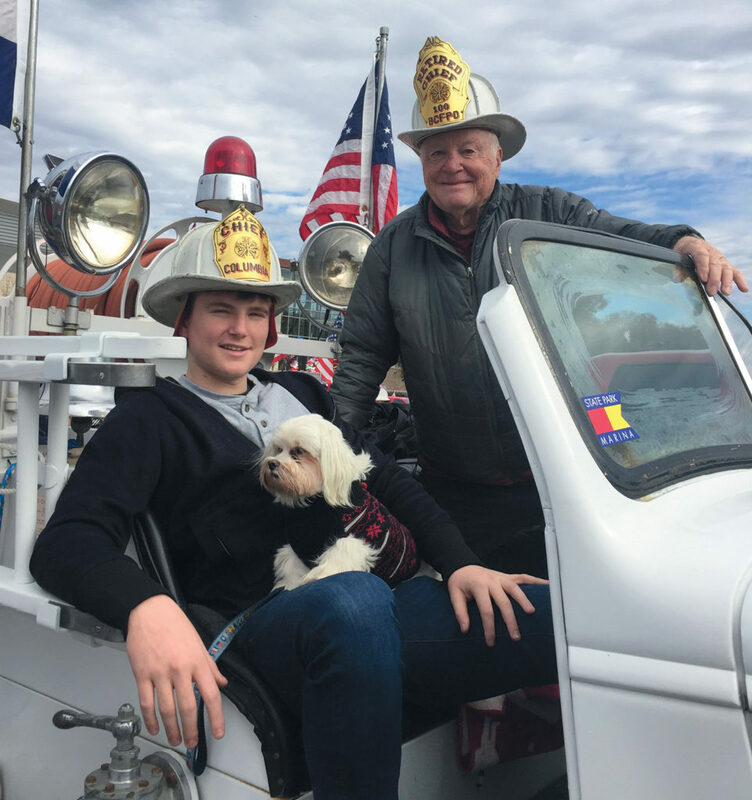 The city made a giant step by providing the fire department with a tractor drawn aerial built by the then outstanding Peter Pirsch and Sons Fire Apparatus Company. Photo credit Roger Nomer/Joplin Globe: 1939 Tractor drawn aerial purchased by the City of Joplin, which remained in service from the time of purchase until 1991. Peter T. Pirsch was born in Kenosha, Wisconsin March 2nd, 1866. His father was an immigrant from Luxembourg and founded a company to build carriages and wagons in 1861. He died of a heart attack at the age of 88 on July 14th 1954. In addition to wagons and carriages the company eventually became known as Pirsch and Sons, Incorporated – known for the construction of classic fire apparatus from the 1920’s through the 1980’s. Memphis Tennessee Peter Pirsch rig shown in this picture from the mid 1970’s. The City of Memphis must have had a surplus of forest green paint because all the metal tread-plate running boards on all their rigs were painted this color. Pirsch patented a compound trussed extension ladder in 1899 and went on to make hand and horse drawn ladder trucks. Their first motorized ladder truck was on a Rambler chassis and was followed by others built on White, Duplex, Nash and Dodge vehicles. The first complete Peter Pirsch fire engines came off the line in their Kenosha, Wisconsin plant in 1926. These were 150 to 750 gallon per minute pumpers, chemical and hose trucks powered by Waukesha engines. In 1928 they produced the first pumper with a fully enclosed cab, the first of its kind from a major US manufacturer. In 1931 a one-man operation hydro-mechanical ladder hoist used on an 85 foot articulated ladder truck was introduced to the industry. By this time the company was building mostly on their own chassis, but others occasionally used were Sterling (1933), International (1936), and Diamond T in 1937. This progression set the stage for the City of Joplin to develop specifications for and order a new tractor drawn 100 foot all aluminum alloy closed lattice aerial ladder, which became a Peter Pirsch specialty. The Peter Pirsch and Sons company continued to make its mark on the fire industry through the sixty’s, seventies and 1980’s. Many large cities such as Washington, DC and Memphis Tennessee had huge fleets of only Pirsch Apparatus exclusively. 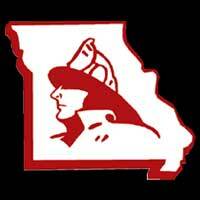 In the sixties and seventies everyone in the fire service would make an annual visit to Memphis to attend the Fire Service Instructors Conference. This was the gathering place for thousands of fire officials from all parts of the nation. 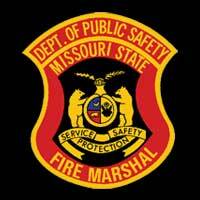 I can recall visiting the headquarters station in down town Memphis and seeing an entire apparatus floor filled with only Pirsch apparatus. Some thirty years before this, the department in Joplin boasted the first motorized fire engine, and a short time later acquired one of the first completely motorized departments in the country. Now, with six brilliant new pieces of streamlined apparatus, the department is lauded by fire underwriters as one of the best equipped in the state. 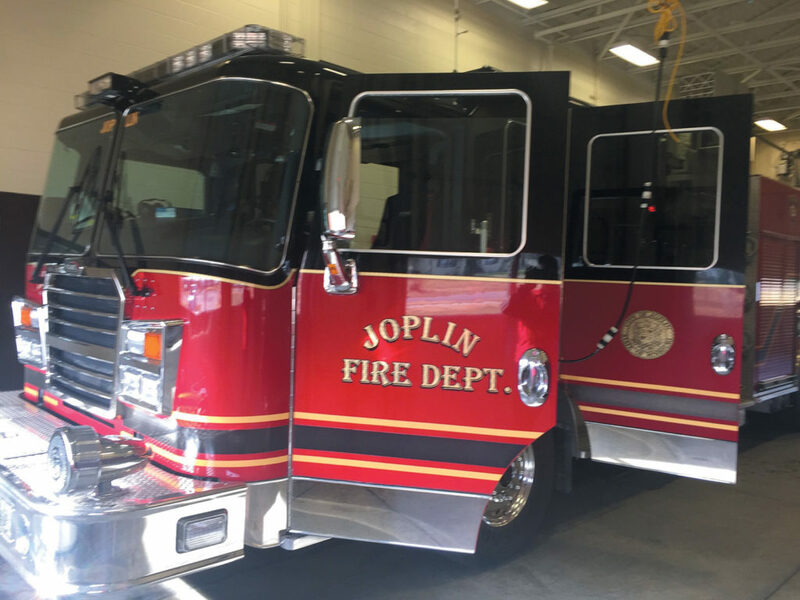 The rehab of the department started in January of 1938 when voters approved to re-equip the fire division of Joplin with a $73,000 bond issue. A citizen’s advisory committee was formed of business leaders who aided the council in the effort. The featured apparatus in this article was one of the headliners in this new effort – the 1939 tractor-trailer aerial truck, along with four engines and a new fire chief’s vehicle, (radio equipped). The Peter Pirsch ladder truck price tag was a whopping $18,000. Joplin firefighters know that this unit has unique place in history of their department. A special effort was undertaken to take it out of “mothballs” so it can be used for special events around the city. Members of firefighters local # 59 sold hot dogs at a local Wal-Mart in an effort to raise money toward the cause. Three of the four new engines were 750 gallon per minute pumpers with a complete load of equipment. The forth was identified in the article as a “booster truck” with a 500 gallon per minute pump. It is a compliment to the fire department staff and community committee to see that all of these units have enclosed cabs. Most units around that time were open cab units like our family 39 Chevy/Central rig. My hometown of O’Fallon also purchased a 41 (or 42) GMC/Central that is an open cab unit. I have never figured out why anyone would purchase a perfectly good commercial chassis with a cab and take a hack- saw and cut the top off! At press time for this article, the manufacturer of the four pumpers in the photo is unknown. BC Doug Nolan is still researching in JFD files to locate that data. 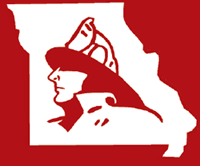 If I was to guess, I would say it is Central Fire Truck Corporation of St. Louis. There are two features that are included in the rigs that are built into all Central rigs of that era. The first is the large 12” flood-light mounted on the right running board of these trucks. 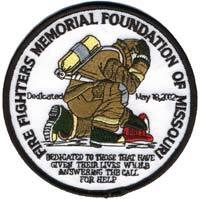 There are two of those on my 39 and one on the O’Fallon unit. The other is the use of the pre-connected St. Louis Squirrel tail hard suction mounting that raps around the entire front of the truck. It became apparent to me as soon as I started this article that Joplin Fire Department has such a colorful over 125 year history that one article could not do it justice. 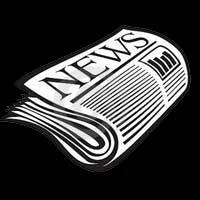 Stand by for the March/April issue of the newsletter to read more about this outstanding organization. One of the highlights of that article will be the very first motorized apparatus for Joplin. This unit was built in a shop in Joplin a stones throw from the main fire station by Al Webb. The Joplin Fire Department’s 1939 – 100 foot tractor drawn aerial shown before its appearance in this year’s Christmas Parade. This photo is part of an article that appeared in the Joplin Globe in May of 1939, showcasing the new aerial – four new engines and a new Chief’s vehicle. All these units were part of a massive overhaul of the department’s apparatus. Author and his grandson James Cox and dog “Charlie” with the “39” at Veterans Parade in Branson. I made a trip to Joplin in preparation to do this article and actually see the 1939 ladder truck and to visit this century plus old fire department. Chief Furgerson and Chief Nolan immediately made me feel at home, as did all their staff at the three stations I visited. The Chief said the department “has always been rich in history and pride” and that is obvious when you visit and will stand out in the second section of this article.